When I was a child, the library of my little Catholic elementary school was my refuge. For a puny kid with terrible eyesight and zero physical coordination, it was a paradise compared to the hot asphalt courtyard where the other kids shouted and ran. They pelted each other with hard rubber balls beneath the tropical Hawaiian sunshine in games of dodgeball that seemed to me nothing more than adult-sanctioned violence, and I didn’t want anything to do with it. The library was cool and dim, with dull metal shelves full of cellophane-covered books that crackled deliciously when I opened them, but that wasn’t why I loved it. Sister Veronica, the librarian, was frankly scarier than getting hit in the face with a rubber ball. Instead of leaving round bruises on your thighs, though, she took vicious verbal swipes. Once, after I stammered out an apology for returning a book late, she ripped it from my hands, sniffing, “Hmmph. Impudent beast!” I told a neighbor boy that story and he laughed, saying, “Oh, yeah? Ask her how many children she has!” (Years later, I figured out he thought she’d called me an impotent beast.) Still, I was willing to brave her. I decided that Sister must love Jesus, to have agreed to be his bride and all, but that she didn’t seem to love anyone else. Nevertheless, I’d find myself happily sitting beside her, more recesses than I can count, in the back room of the library that doubled as a study space and a tiny boutique that sold handicrafts made by the nuns, prayer cards, and religious medals. Beside the one long work table that kids could sit at to read or do homework, there was a basket filled with white cloth squares. I now realize these were cut up pieces of the nuns’ old habits. After checking out the latest Nancy Drew novel or a tale of adventure in the Arctic north, I’d head back to the table, grab a pile of those cloth squares and get to work. 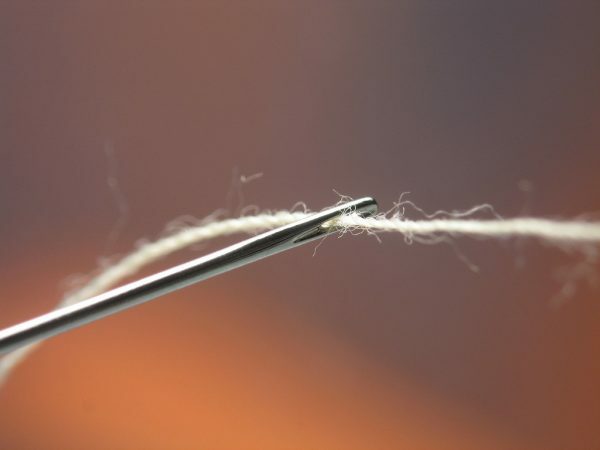 My friends and I would sit there, carefully and methodically pulling threads from a square until the material had been completely unraveled. Sometimes, if the cloth was a stubborn one and wouldn’t give, I’d take a straight pin, insert it near the edge, and gently wiggle until it made a space between the threads. When we were finished, we’d present the fluffy piles of thread to Sister Veronica, who accepted them with pursed lips. If we did enough squares, she gave us prayer cards printed with a picture of a saint on the front and that saint’s particular prayer on the back (the saints were specialists, I learned – St. Anthony for lost objects, St. Jude for hopeless situations like dire illness or math tests). We collected and saved them the way my daughter does Pokemon cards. The reward for our work: talismans of hope. To this day, I have NO idea what that was for. Maybe she used the threads to stuff cushions or as quilt batting. Maybe it was some sort of ingenious way to occupy fidgety kids who would otherwise be whispering and giggling and committing other terrible library offenses. Maybe it was penance. What I do know is that it soothed and satisfied me deeply – this intricate process of loosening and drawing and undoing. It was miraculous to me to hold a linty ball in my hand that had once been a tightly woven piece of cloth. At this point in my life, the unraveling of old bits of habit is an apt metaphor for my journey. The scraps are pieces of cloth called “Can’t,” “Won’t,” “Don’t have time,” and “Don’t know how.” I stick pins in the edges and work them back and forth until something gives. Here: a compromise between this commitment and that. There: the willingness to be wrong and look stupid doing a new thing. Now: fifteen minutes – okay maybe ten – to walk and breathe and admire the crazily blooming spring flowers. I work one string at a time until there is breathing room, and what I’m left with is soft and light. I don’t know what the purpose is – only that it is satisfying and that I am transformed. Photo credit: “Thread” by Andrew Magill is licensed under a Creative Commons Attribution 4.0 International License. I initially skipped over this with the thought, “I’d read it later.” But the image & title drew me in. Interestingly, I found it profound, that this story could easily have been childhood trauma that negatively shifted your life, but because of your character, your own curious nature it served you then unknowingly. To eventually be a small part of your foundation in your journey & life transformation. It was in your ability as a youth to move through that experience in a literal sense without rebellion of youth that is most astounding. Only through the direction of tasks, does a nun’s does real influence emerge so strongly in life. Hugs to Sister Veronica for what she gave you.